The sales funnel is the Holy Grail of marketing metaphors. For anyone who wants to have a successful business, a convenient scheme describing how to make people buy your product or service is extremely appealing. Social media typically fits at the top of a classical sales funnel - it is supposed to bring strangers into your sales funnel, with other strategies kicking in afterward. However, with the development of social media and the introduction of new tools, sales funnels have changed and evolved. Avoid the pitfalls that limit engagement with your target audience. Take a look at 10 common mistakes businesses make on social media to avoid them. Nowadays there are multiple ways to view sales funnels: as a reverse funnel, a pipeline, and even as some kind of sales Ouroboros. Some people reject the concept of a sales funnel altogether saying that every customer is unique and can’t be described as a one-size-fits-all model. "For years, touch points have been understood through the metaphor of a "funnel"... But today, the funnel concept fails to capture all the touch points and key buying factors resulting from the explosion of product choices and digital channels, coupled with the emergence of an increasingly discerning, well-informed consumer". Even though I think that a sales funnel can be a useful way to understand a buyer’s journey, being a Social Media Marketing Manager, I’m interested in how recent innovations in the social media world could have changed it. In this article, I want to focus on a specific tactic, such as social listening, and how it can be deployed at every stage of a sales funnel. Social listening is a process of monitoring keywords and keyword combinations on the Internet as well as gathering and analyzing social data, often using a social media monitoring tool. This strategy can be used in a lot of different ways that can benefit your sales funnel. I suggest we go step by step and see how we can use social listening to attract, convert and close sales on social media and elsewhere. However, since the sales funnel is described in so many different ways, let’s talk about the definition of this model first. Mind you, the last stage (ideally) entails turning the customer into a brand advocate who is going to bring more people into your sales funnel and so on, and so on, and so on. Easier said than done, you will say and I will enthusiastically nod. An average buyer’s journey is much more complicated than these three steps and requires thorough strategizing, careful evaluation of your marketing channels and dozens of marketing activities to bring a prospect to the bottom of the funnel. Modern marketers have a huge variety of tactics and tools at their disposal and I encourage you to figure out what works for you. Let’s see how making social listening a core part of your sales funnel can be beneficial at its every stage. 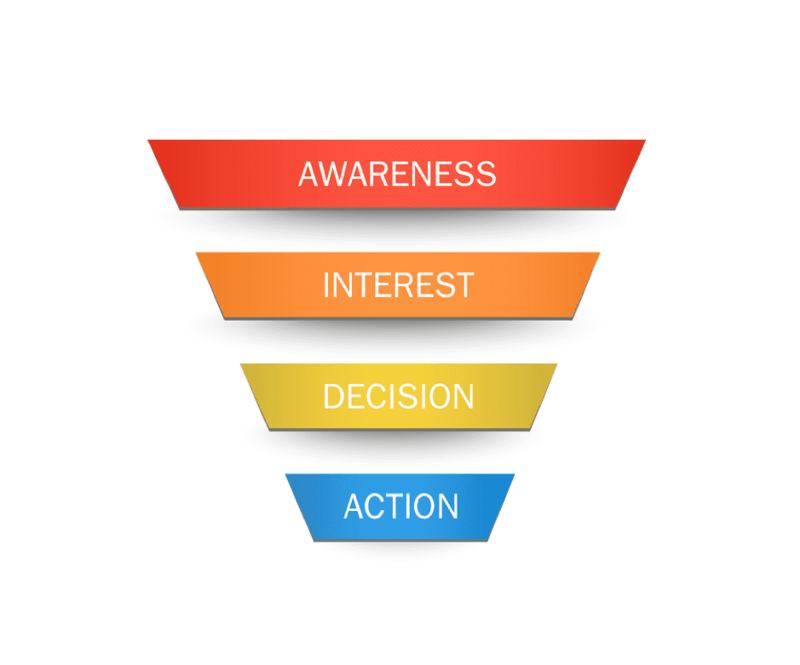 Awareness is the first and probably the simplest stage of a sales funnel: all you need to do is make people aware that your product or service exists. In the classic world of marketing, this would be done by advertising in traditional media. So how does social listening come into play at this stage? First of all, a successful marketing strategy always includes a research stage and that’s exactly what social listening can help you with - the research. To reach your target audience, you need to know where they are. You can do that by selecting a number of keywords relevant to your industry and putting them into a social media monitoring tool that supports multiple social media platforms to see which platform hosts the biggest amount of conversations surrounding these topics. Let’s say you’re developing a social media strategy for a new audiobook platform and you need to decide which channels to focus on. 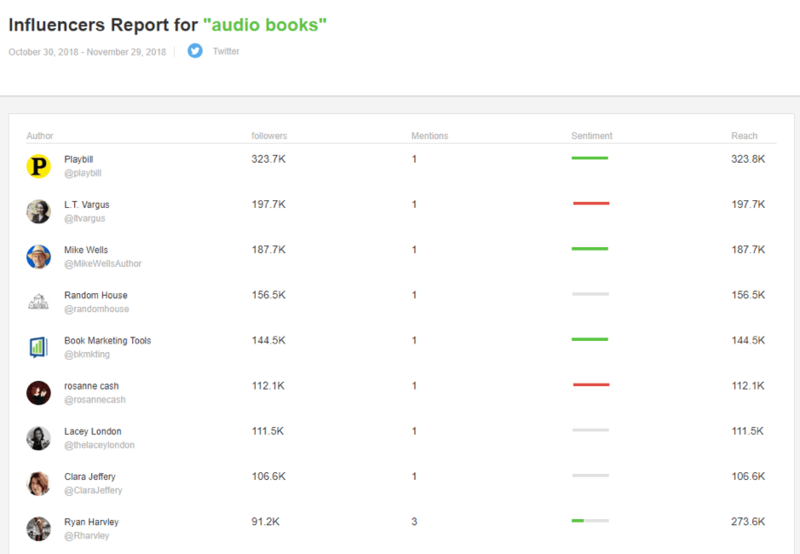 You should put in keywords and keyword combinations like 'audiobooks' and 'listen to a book', as well as the brand names of your competitors (Audible) in a tool like Awario and see which platform pulls more mentions. A lot of social media monitoring tools also provide an Influencer search feature, so you can use it to identify micro-influencers in your industry. The Interest stage is sometimes also described as evaluation, which is especially relevant for digital marketing. On the Internet, people have access to an unlimited pool of opinions, reviews and comments to help them make informed purchasing decisions. According to this research published by McKinsey, two-thirds of the touch points during the active-evaluation phase involve consumer-driven activities such as online reviews and word-of-mouth recommendations from friends and family. The research was conducted in 2009, and in 2018 it’s obvious that word-of-mouth marketing has long since moved to social media. Your job here is to make sure that you provide your potential customers with all the information they might need to make a decision, as well as react to organic opinions and reviews from elsewhere. Of course, we as customers are often too busy (or lazy) to actually do thorough research before buying a new time management app, so one tweet praising Pomodoro in our timeline can do the job. Social media monitoring can help you make sure you don’t miss any publicly expressed opinions about your brand. Simply put the name of your brand into a tool and see what people have to say about you. Most tools will also analyze the sentiment of your mentions, so you can choose to deal with negative reviews first and then go on to acknowledge and share the positive. What’s more, if you want to learn from someone else’s mistakes rather than your own, it’s always a good idea to monitor your competitors. You may discover the lack of some features in their product and emphasize these very features in yours when pitching to a potential customer. Naturally, the progression of coming across a brand to getting interested in a brand leads to some kind of interaction with a brand. This may be talking through a live chat, sending an email, or interacting with the brand’s social media profiles. This step doesn’t mean likes or shares, which are considered engagement in social media analytics. The Engagement stage requires bilateral communication. Even social media platforms understand that comments and responses, that is, feedback on your social content, is the most valuable kind of reaction. That’s why social media algorithms prioritize content with a lot of comments. See all your tagged mentions from multiple social networks in one feed and reply to them in real time. Discover untagged mentions of your brand and engage with them. Monitor relevant topics to discover opportunities for engagement. We could say that this Twitter user was at the Interest stage of the funnel, researching on Twitter which product he should buy. 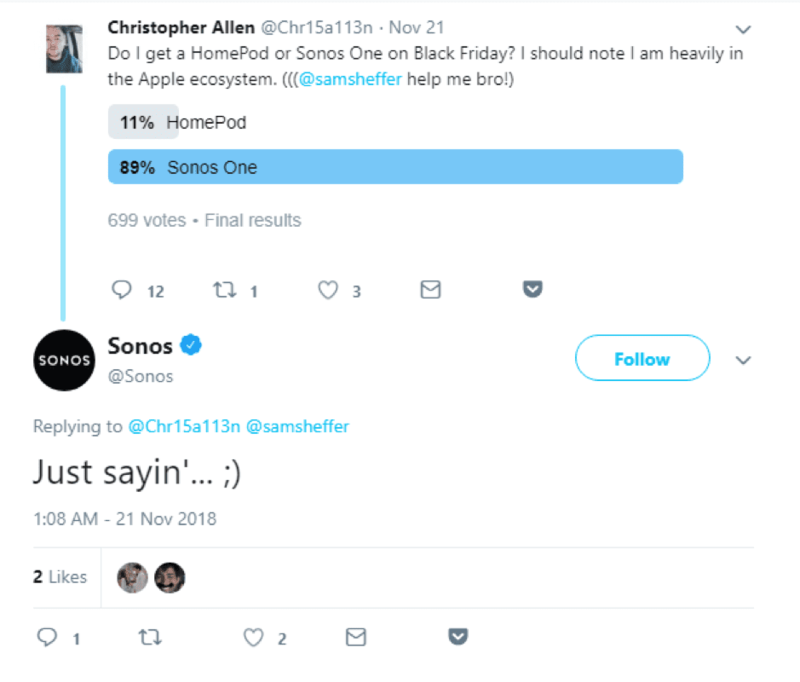 Chances are the reply from Sonos was the last convincing argument for becoming their customer. The last stage of a sales funnel is, obviously, the sale. However, no matter how much of a social media marketing proponent you are, you probably don’t believe that it’s possible to sell on social media. You inform a prospect, engage with them, but to make the final decision they need something more than a Facebook post - or so you think. Well, let me convince you otherwise. But first, a bit of marketing theory. Low interest and low fit: These are basically people who stumbled on your brand and stayed there out of curiosity. They don’t have any intention to buy from you or from anyone else in the near future. An example of this type of lead could be a low-level company employee who’s browsing solutions out of curiosity, not an immediate need. High interest and low fit: These leads actually want to buy a product but are unlikely to go with yours. For instance, a CRM platform aimed at Enterprise-level businesses won’t suit a solopreneur. Low interest and high fit: Typically, these leads closely resemble your target customer but aren’t actively seeking solutions. Even though they may not be a good fit right away, it may still be worth pursuing them to create brand awareness that will pay off down the road when their need becomes apparent. High interest and high fit: These leads are the "sweet spot" of people who are actively seeking your type of solution and are likely to convert to buyers. The last type of lead is exactly what we’re interested in when discussing selling on social media. Social listening lets you connect with your perfect customers, as well as pitch and sell directly to them. It may sound a bit like a fairy tale, but if you think about it, how many times you yourself posted a Facebook post asking for recommendations? Just earlier in this article, we saw an example of such purchasing behaviour. Browsing Facebook/LinkedIn groups and subreddits related to your industry. These types of communities created around a specific topic are a gold mine for lead generation. 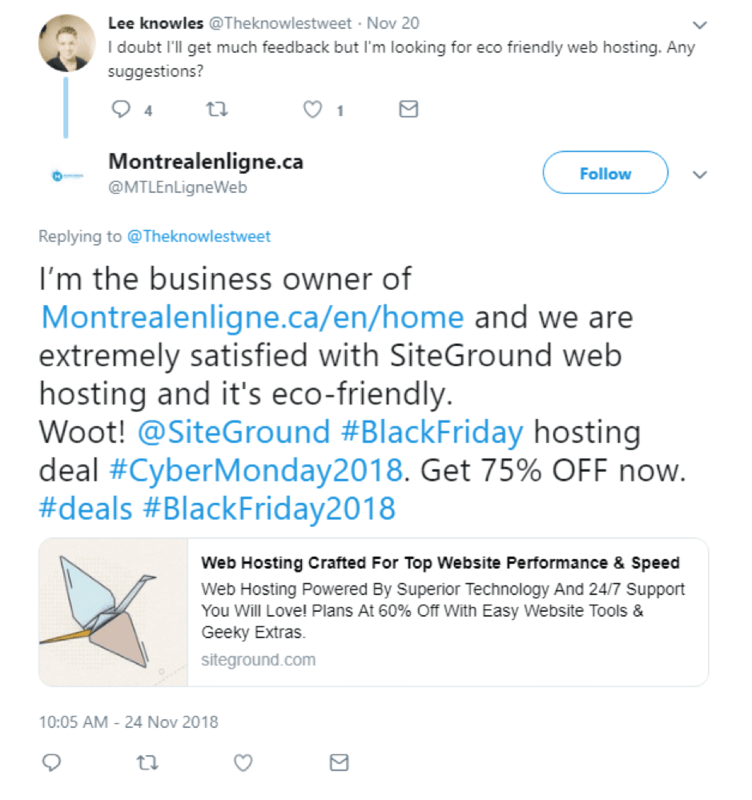 Monitoring for product/service-related social posts. This is made possible by a social listening tool with a flexible search mode where you can combine relevant keywords with phrases wthat are often used to express buying intent, like "can anyone suggest" or "what’s the best". Awario is, to my knowledge, the only tool that has a designated sales prospecting feature. There you can put in short descriptions of your products and services along with your main competitors, and Awario will find you leads on Twitter, Facebook, and Reddit. According to this social selling study, engaging with High Interest/High Fit leads on social media is an extremely rare case, which is good news for you - your brand gets a unique chance to stand out from your competitors. 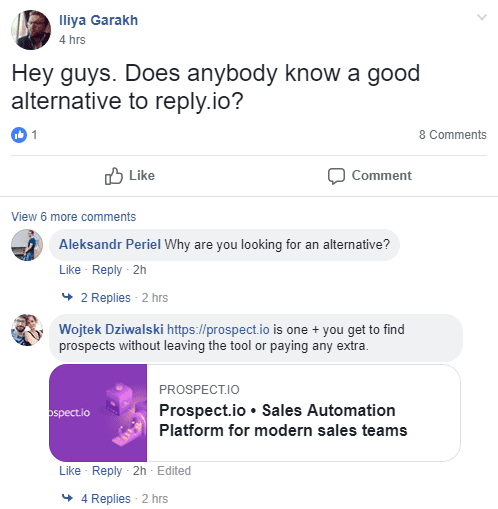 Moreover, before pitching, you can look through a user’s social media profile or ask them a question about their requirements to raise the probability of a sale. In the end, I can agree with the post-sales funnel marketers: the multiple marketing channels available to your audience nowadays make each buyer’s journey unique in one way or another. The concept of a sales funnel was created in 1898 and it would be foolish to think that it has stayed the same. I encourage you to see new facets in old marketing theories and treat them more like points of reference than a rigid framework. New technologies and ways of communication appear constantly, so use the power of strategies like social listening to your advantage. Anna Bredava is a Social Media Marketing Specialist at Awario. She writes about social media trends, small business marketing, and tools that help anyone interested in marketing.